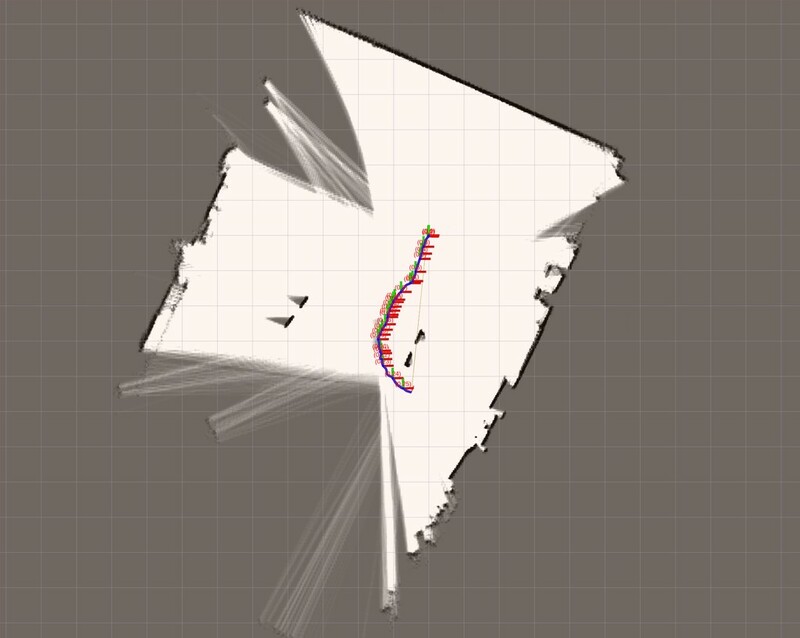 Here is the 2018 game animation. 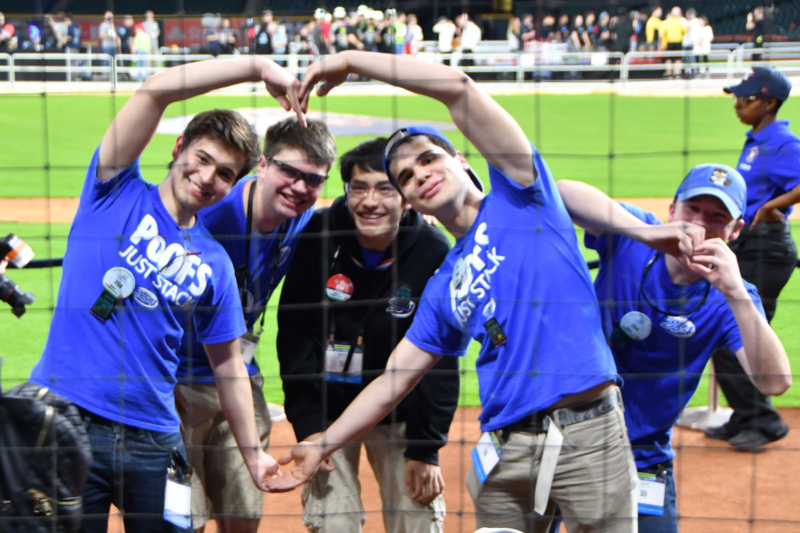 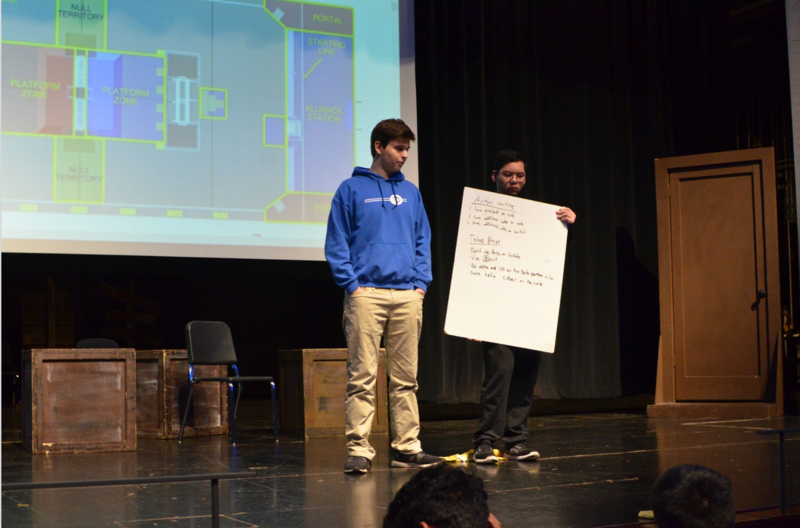 This year’s game involved many variables, requiring a strategy that succeeded in performing all tasks presented in the challenge. 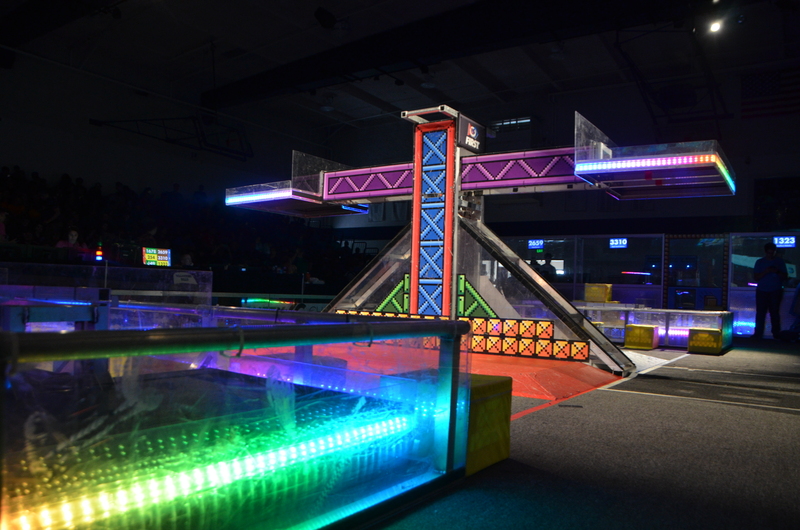 With the power ups, scoring based on points/sec, randomized sides, and the difficulty of climbing, no straightforward strategy which ensures a win presents itself. 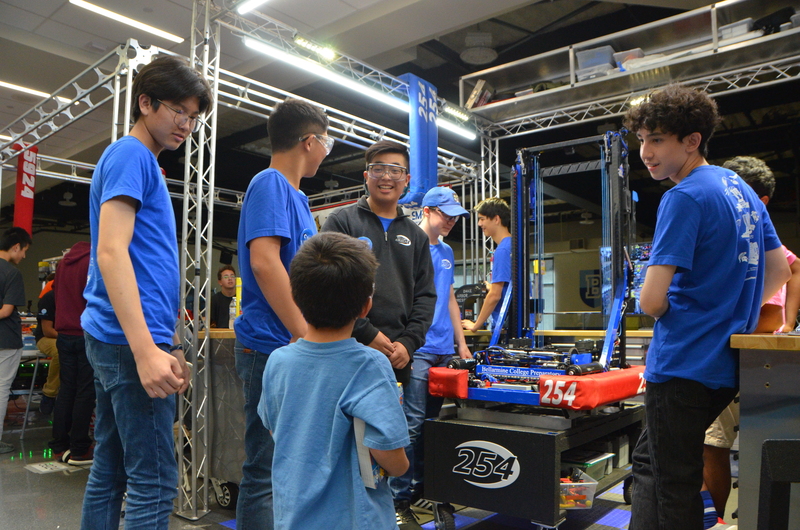 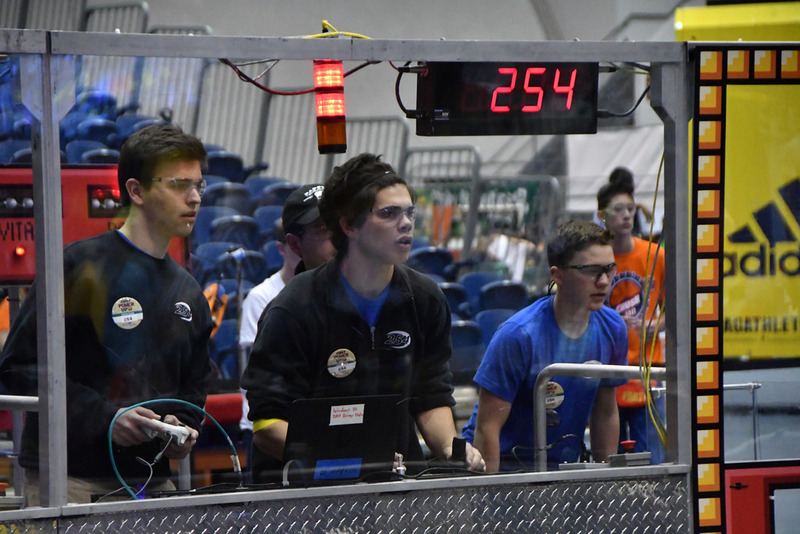 After trying various combinations of scores, we concluded the best way to maximize our points would be during autonomous when the scoring is scaled by a factor of 2 and during the endgame when each climb is worth 30 points. 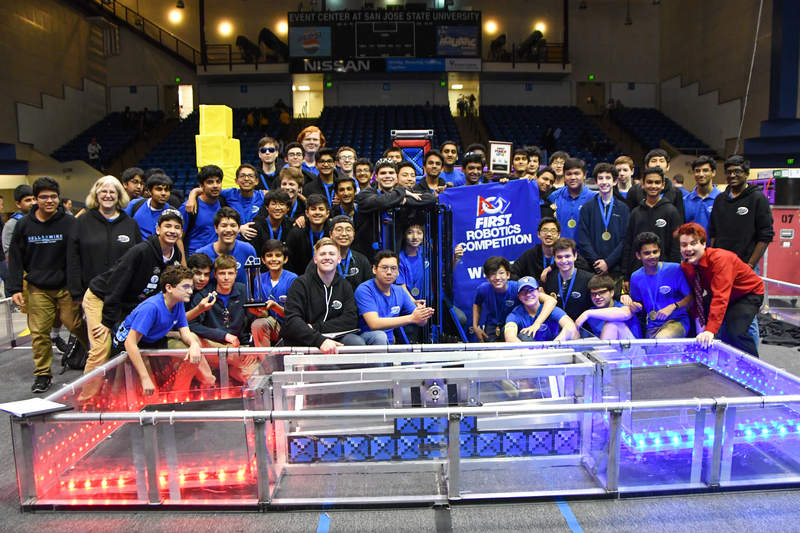 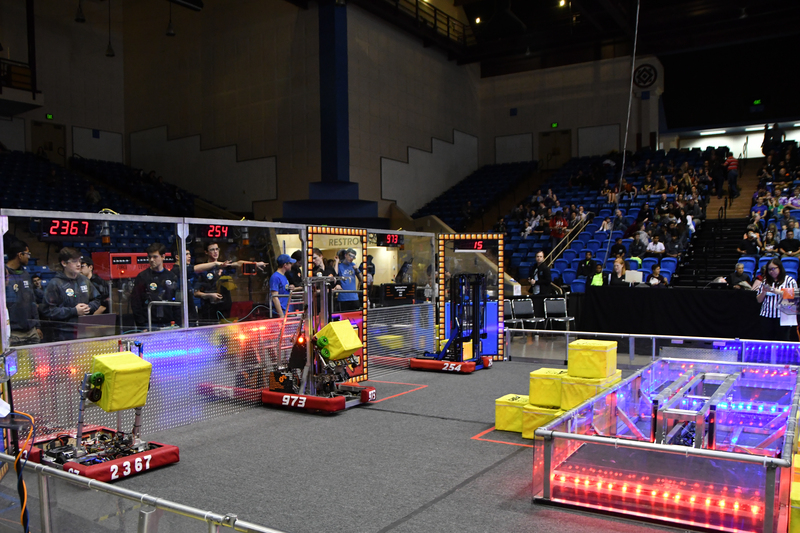 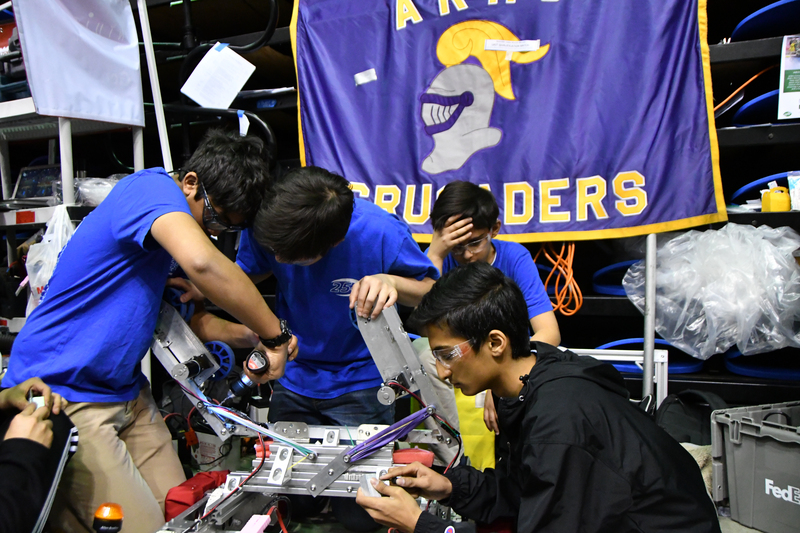 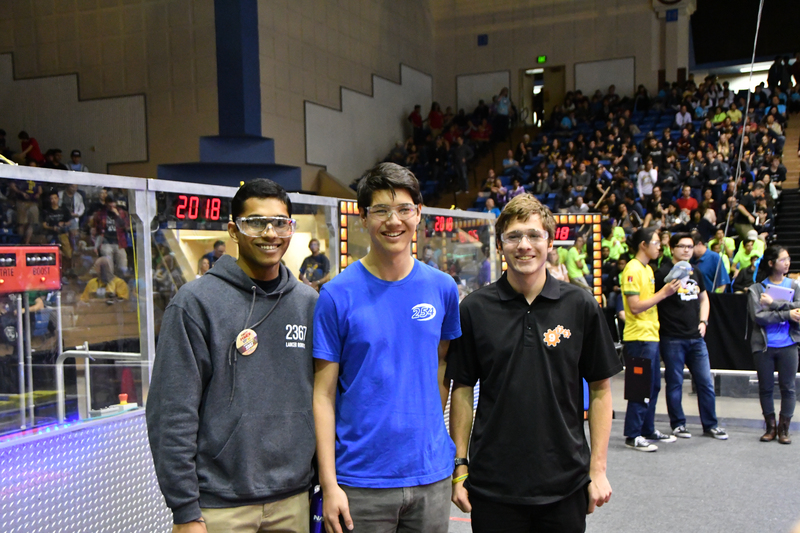 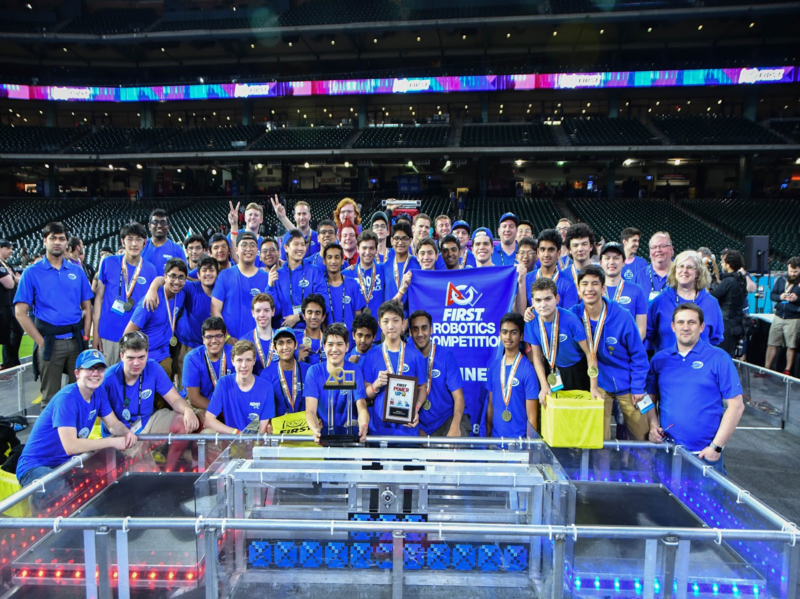 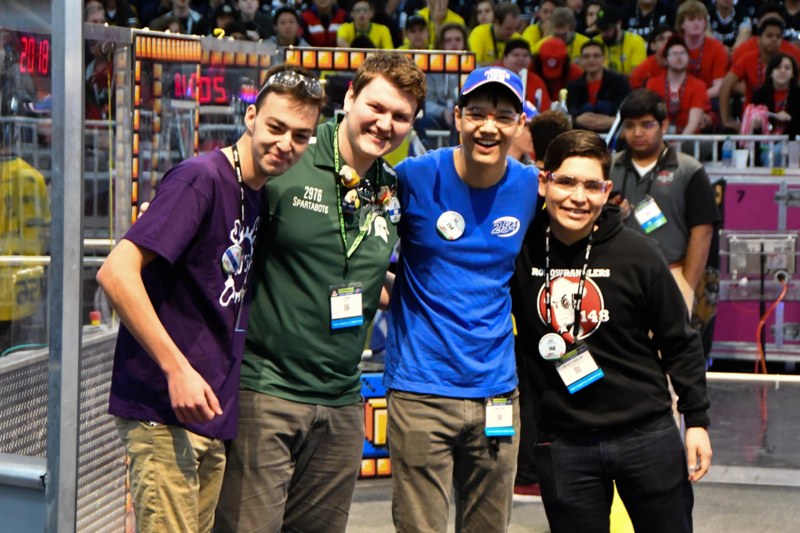 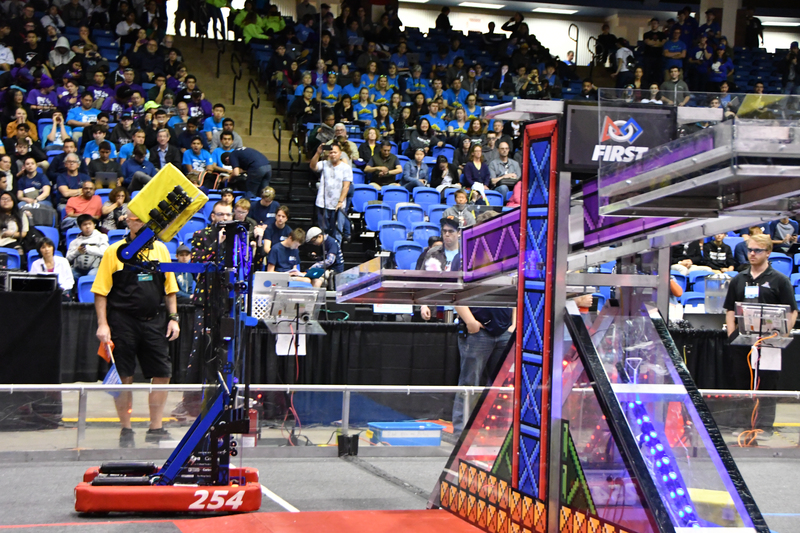 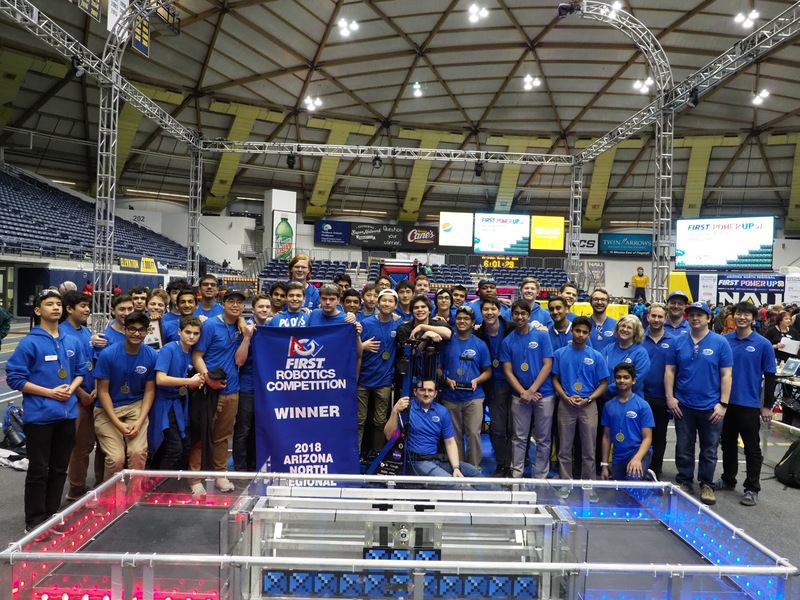 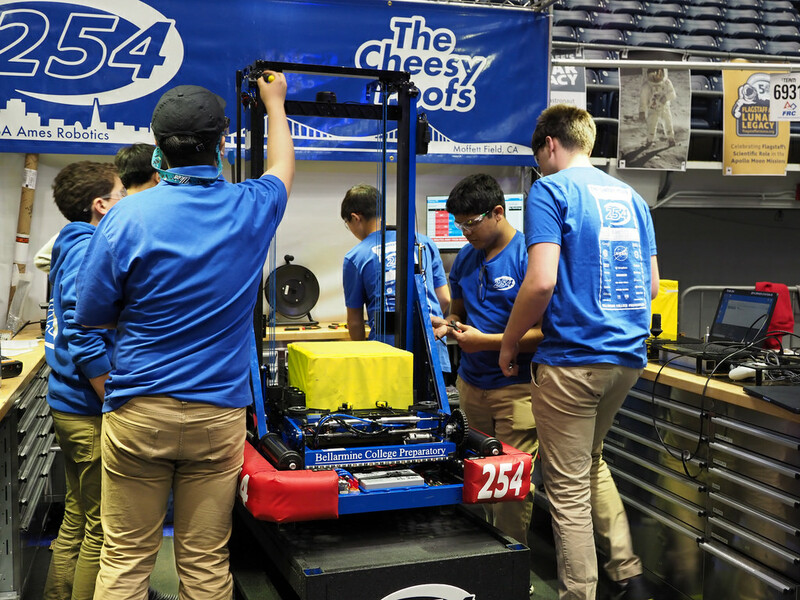 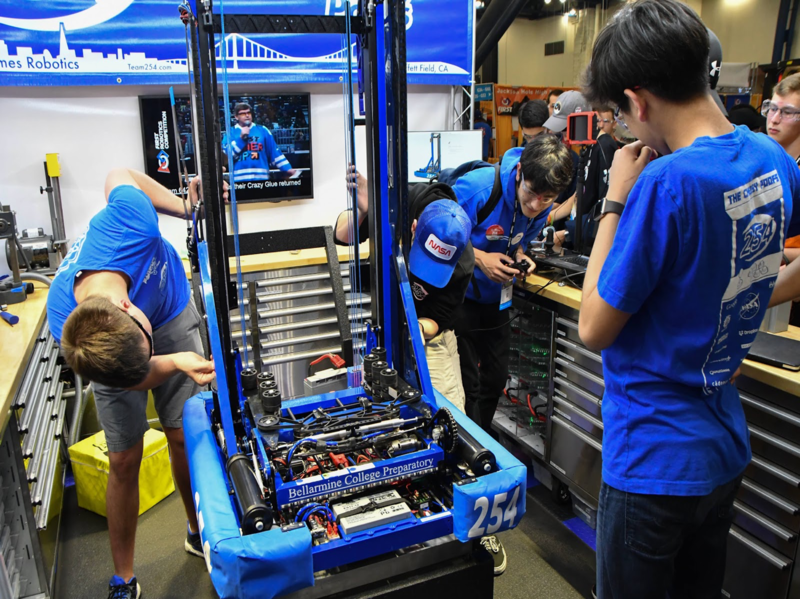 Since autonomous scoring is worth more than tele-op scoring, we decided that autonomous scoring was a major priority to stay ahead during a match. 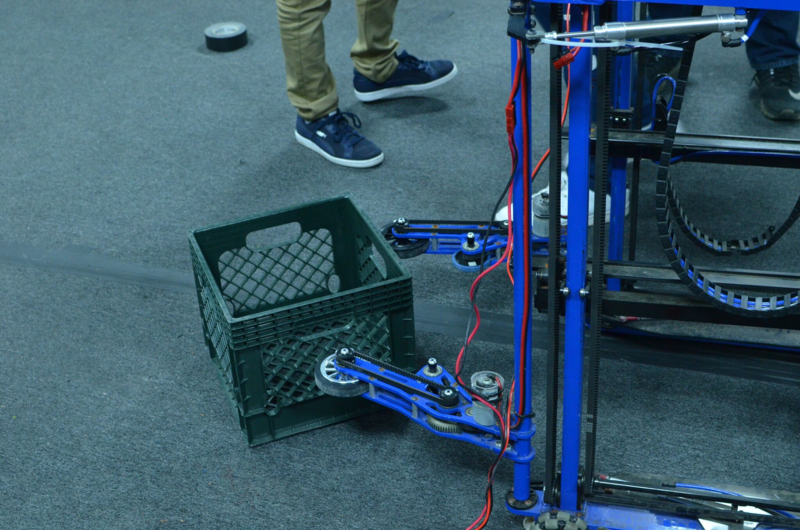 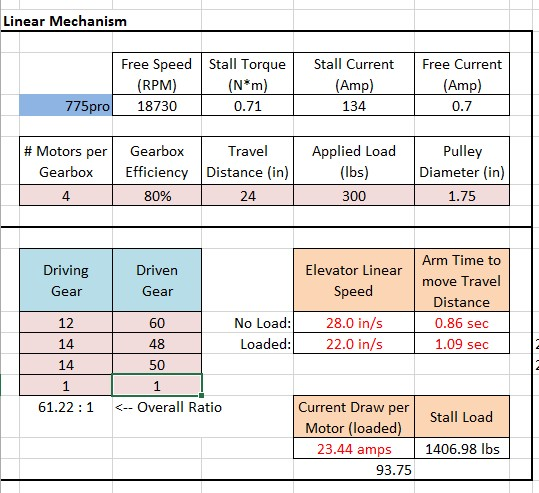 We planned for short paths to score cubes (<30 ft), so drivetrain acceleration and our ability to score from either side of the robot was critical for rapid cycles. 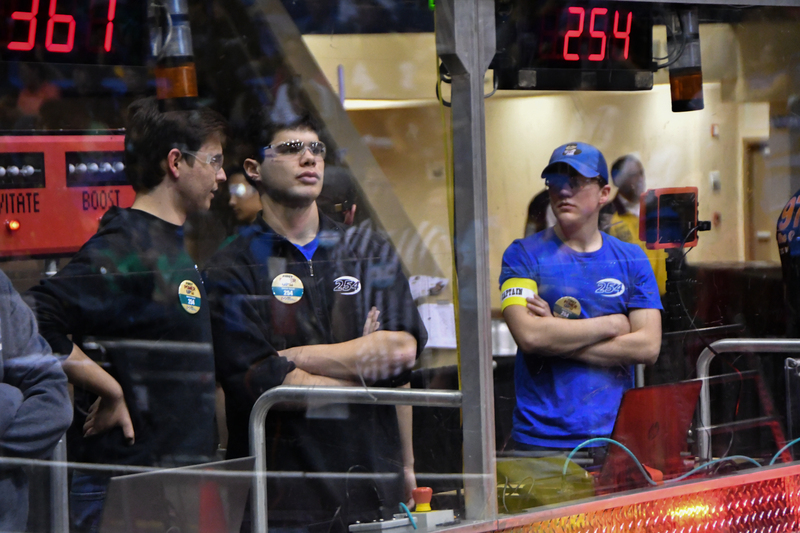 We debated between starting off on the middle or side of the field. 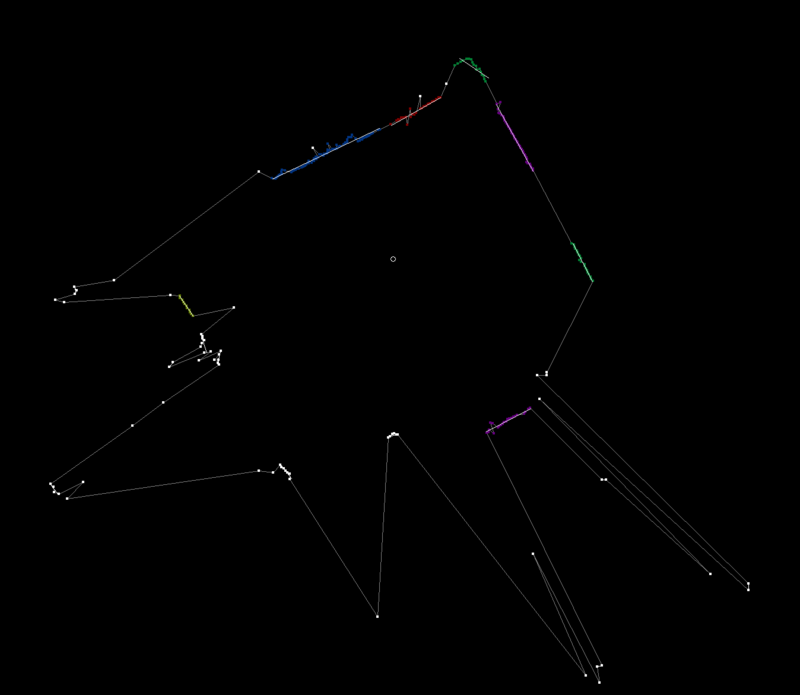 If we were to start off on the middle, we would have an equally distant route to reach the switch and scale. 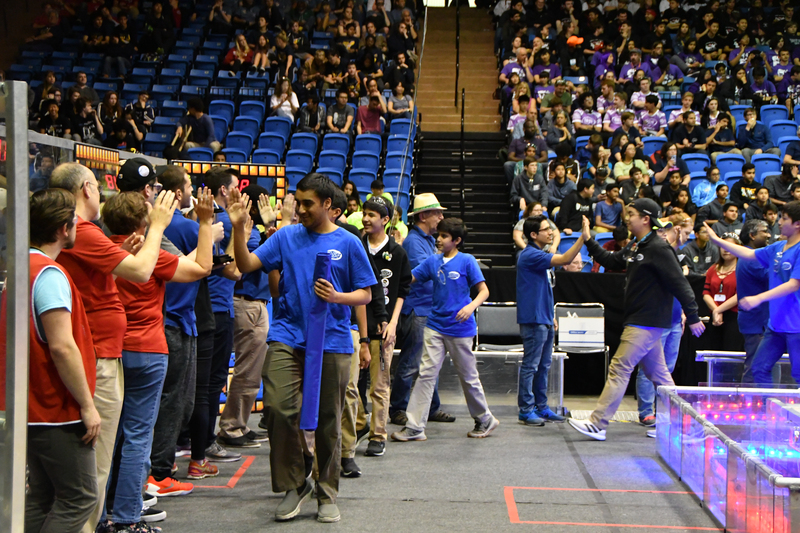 However, we could not guarantee the successful completion of our autonomous route as our alliance partners may get in our way. 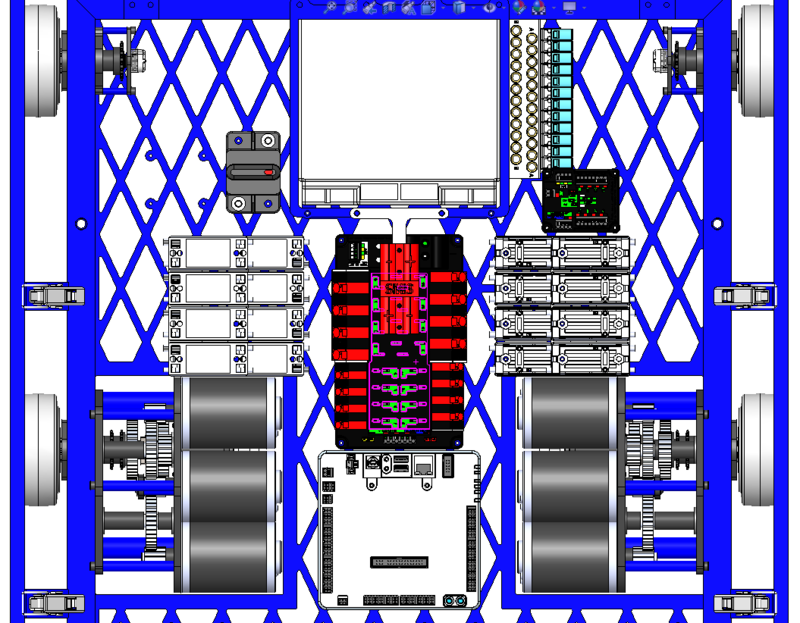 If we were to start on the side, we may either have a very long or a very short route to reach the switch and scale. 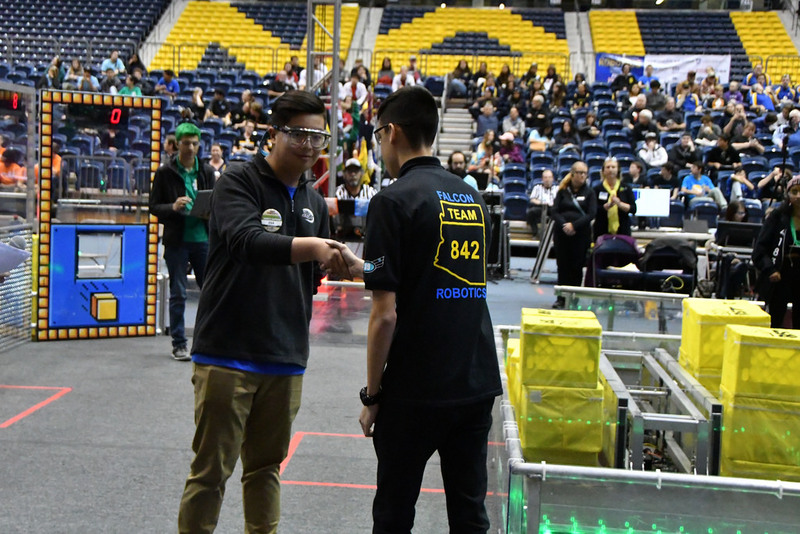 However, we could guarantee the successful completion of our autonomous route as our alliance partners would not get in our way. 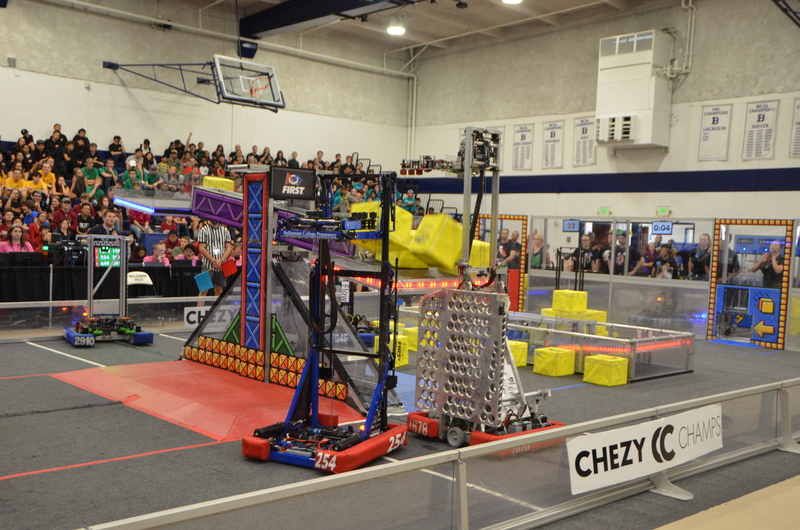 During the endgame, we aimed for having all 3 robots climb or by having 2 robots climb and 1 levitate. 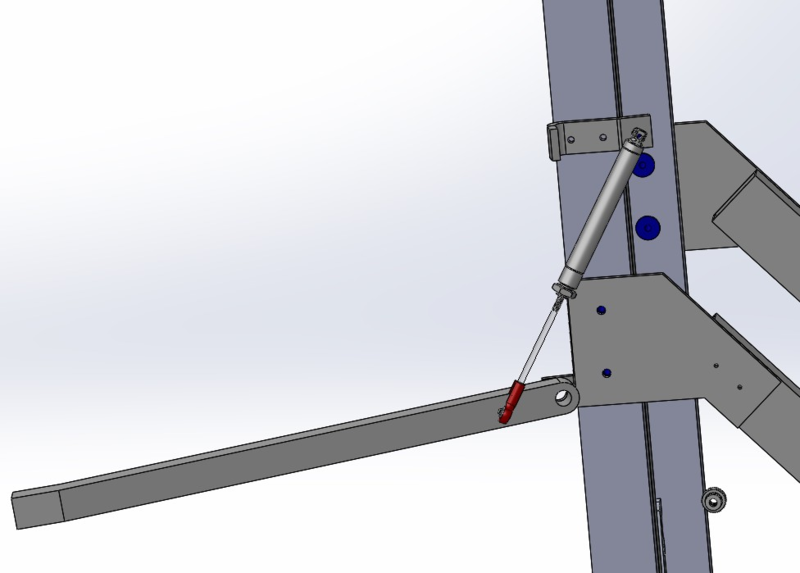 We fixed the 2015 drivebase which was missing a control system. 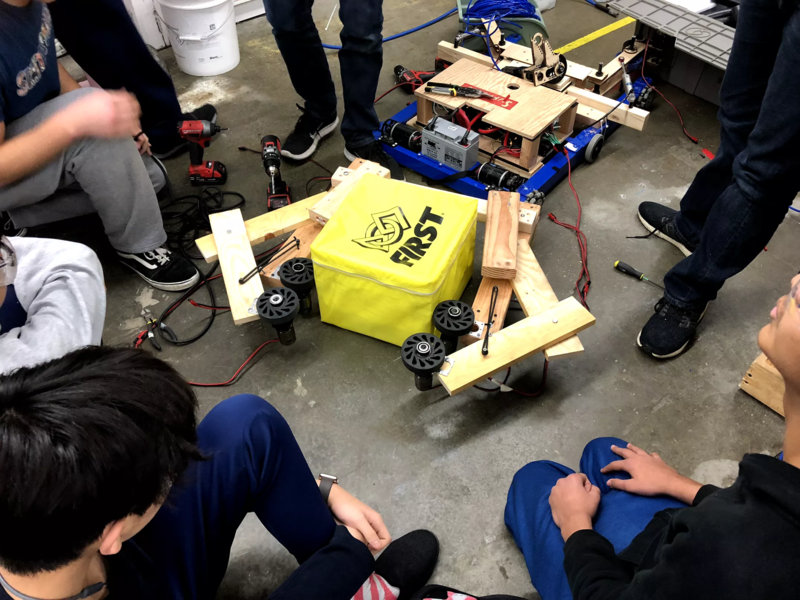 We mounted our development board on the drivebase and programmed it to drive, but immediately saw issues as it went up the ramp. 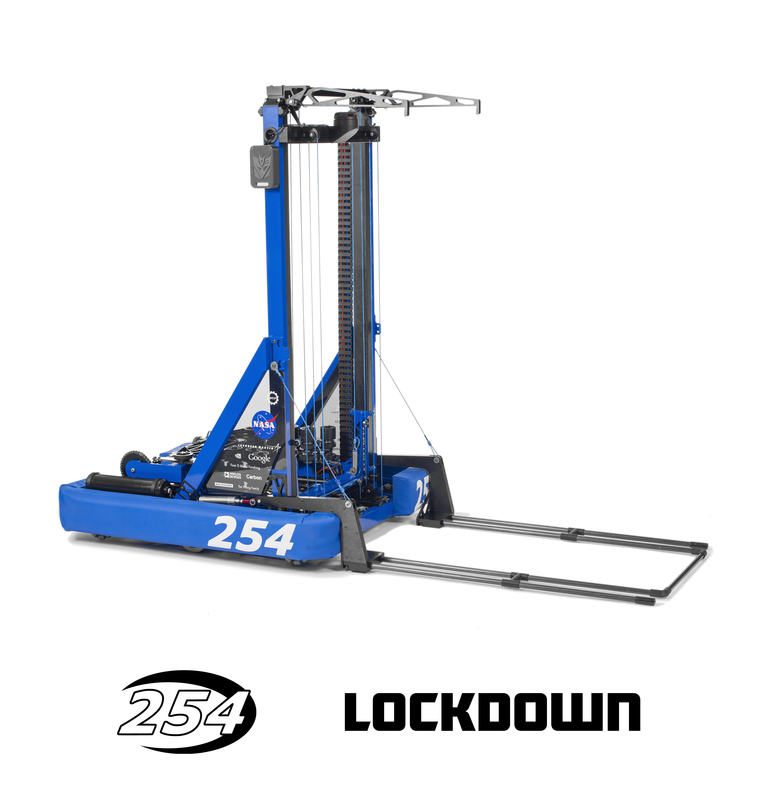 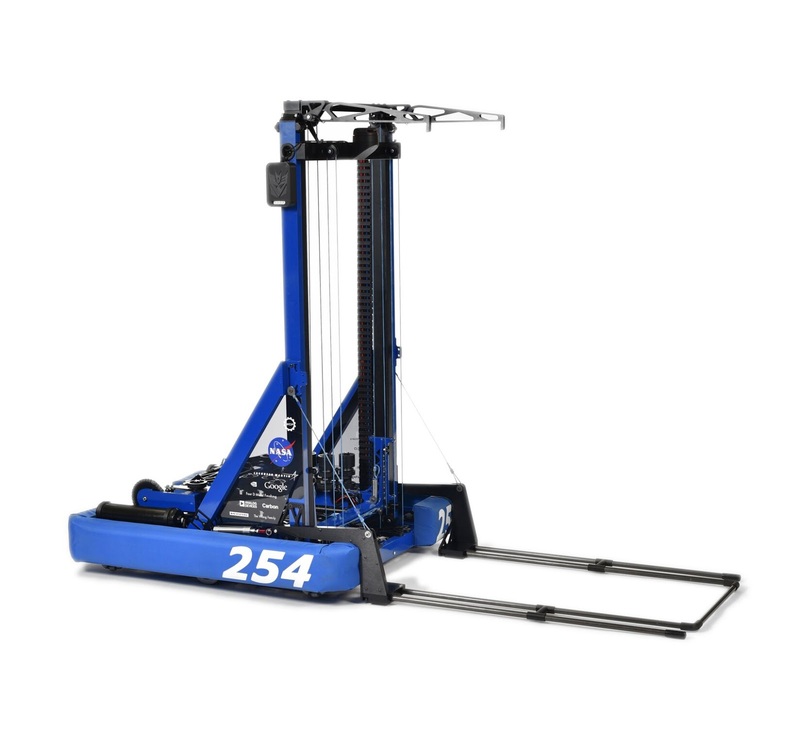 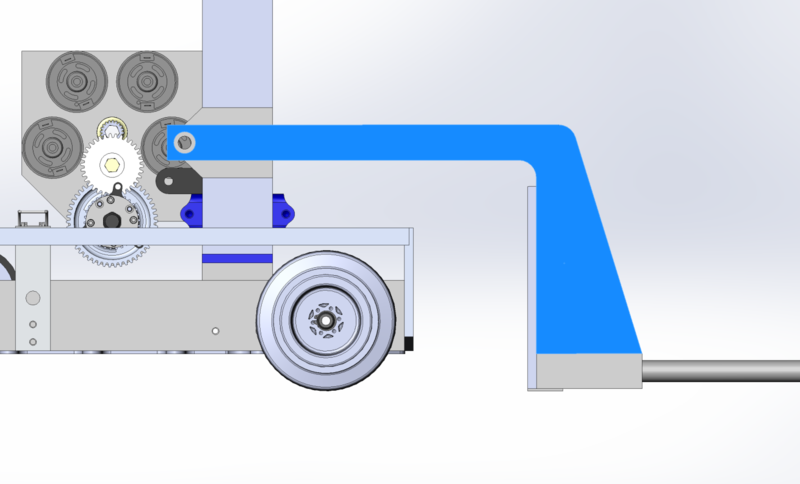 Because of the long wheel base and short distance between the wheels and the ground, the drivebase high centered on the ramp when the bellypan came into contact with it. 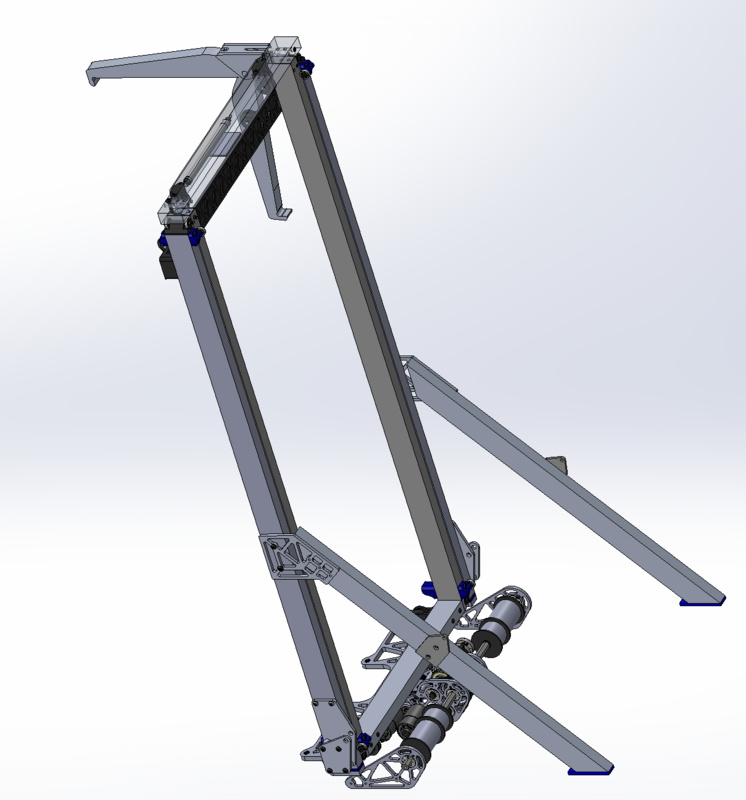 This result shows that for our 2018 drivebase, we will need a shorter wheelbase and a greater centerdrop. 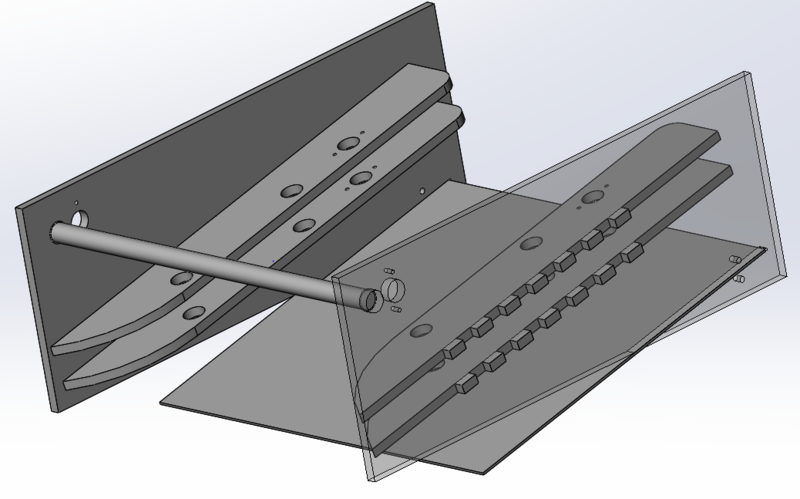 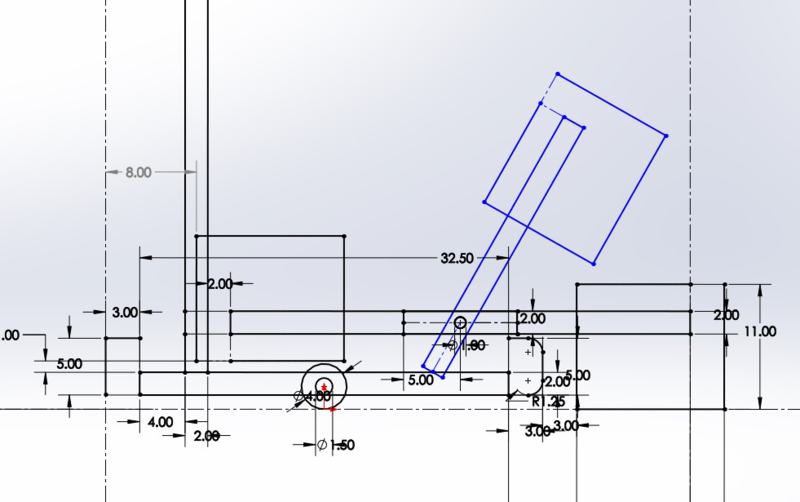 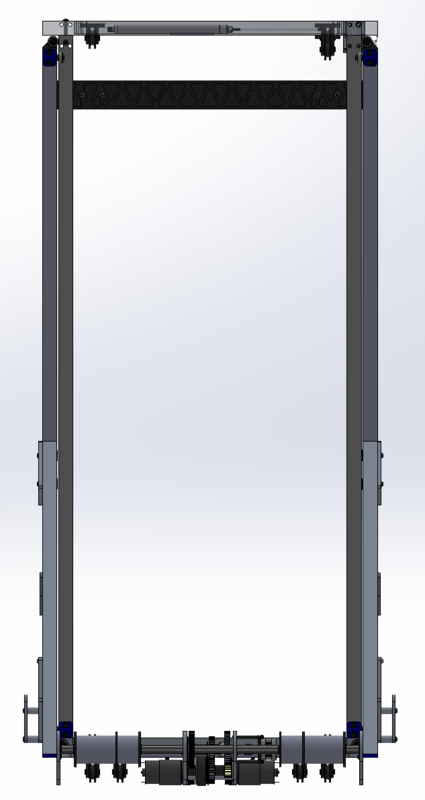 We modelled in CAD the motion of a possible 2018 drivebase going over the platform ramp without high centering. 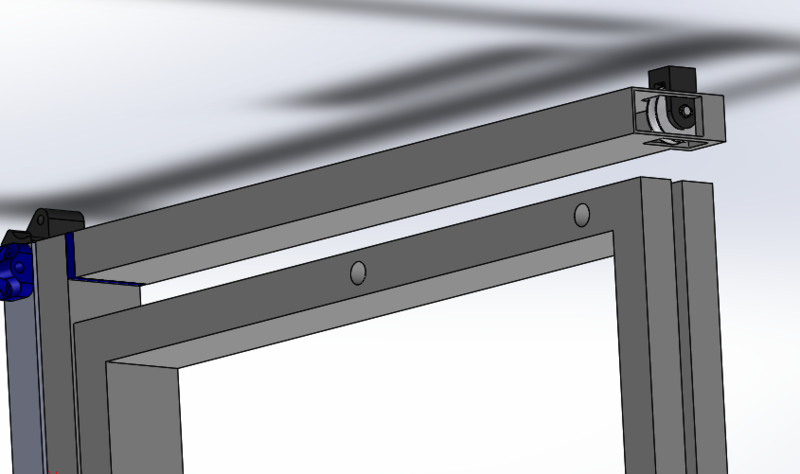 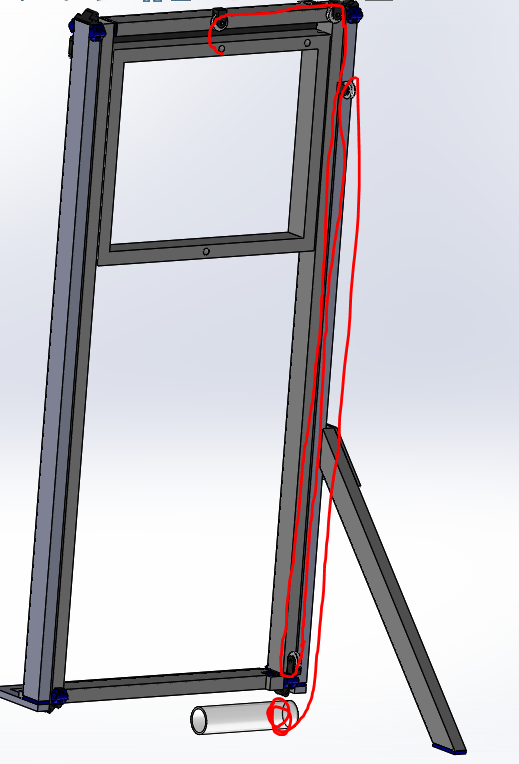 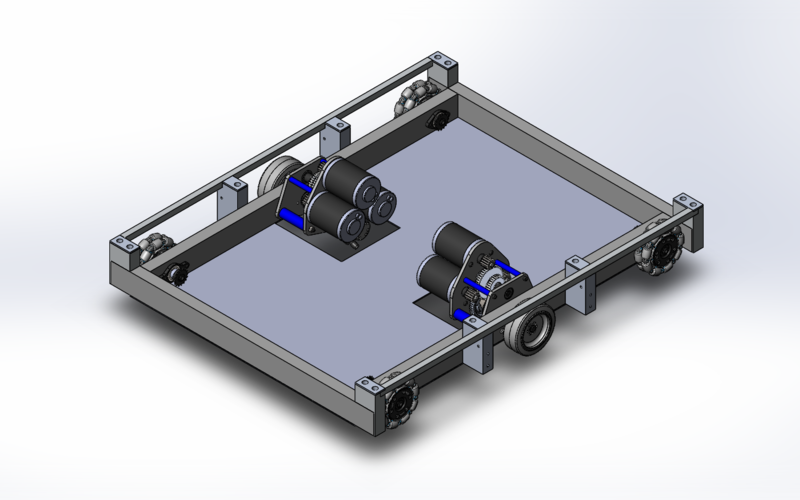 We tweaked two factors (distance of outer wheels from side edge of frame rail, center drop) until we arrived with the dimensions of a drivebase that would safely clear the ramp with 4 wheels (2 on each side) always contacting it and without the bumpers or bellypan ever contacting it. 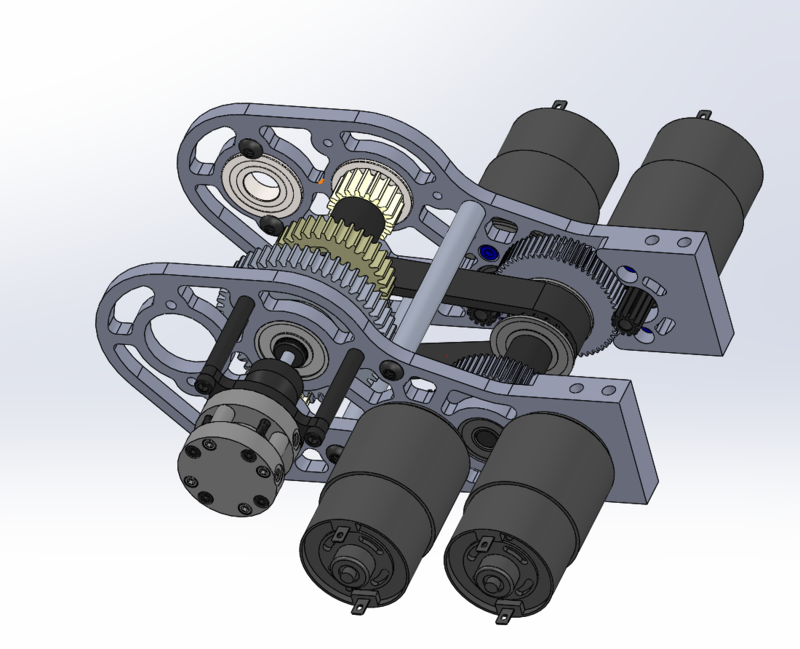 We fixed the 2015 intake which was initially missing the intake wheels, shafts, and timing belts. 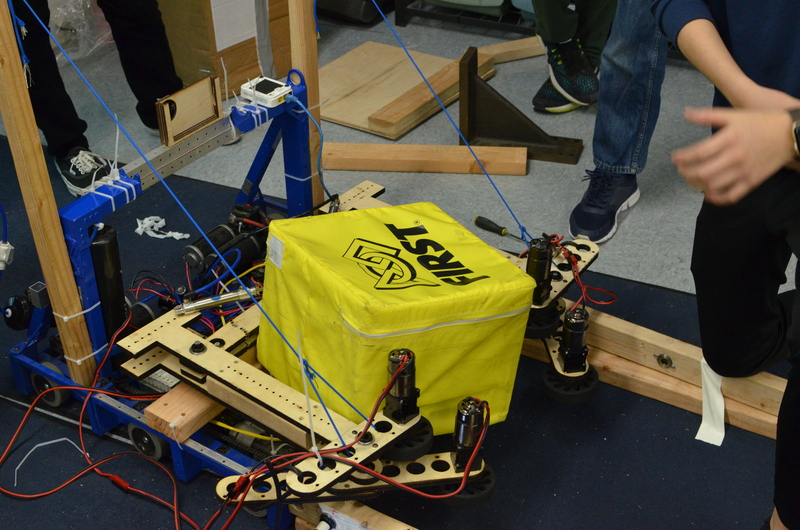 We used this intake to prototype the intaking of the Power Cubes. 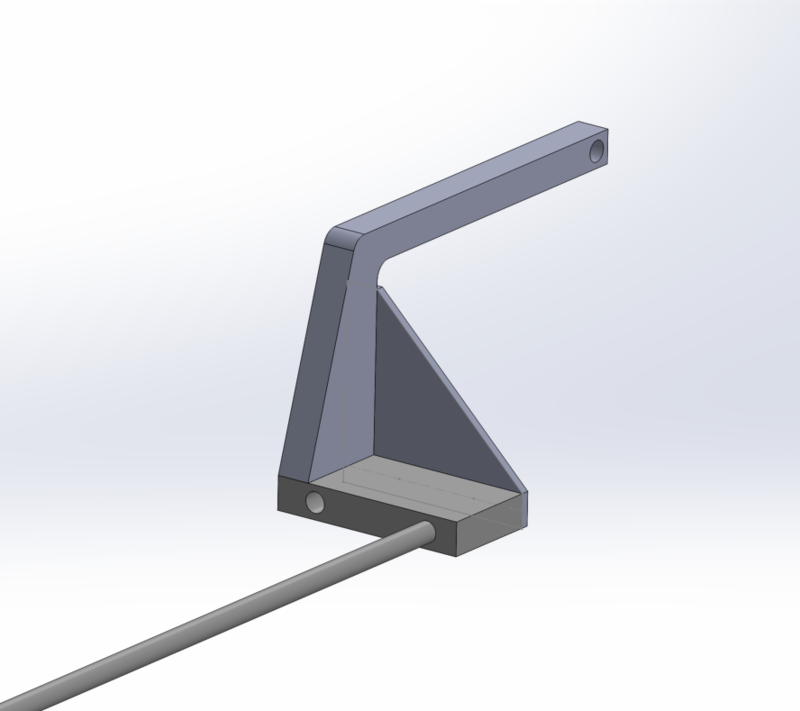 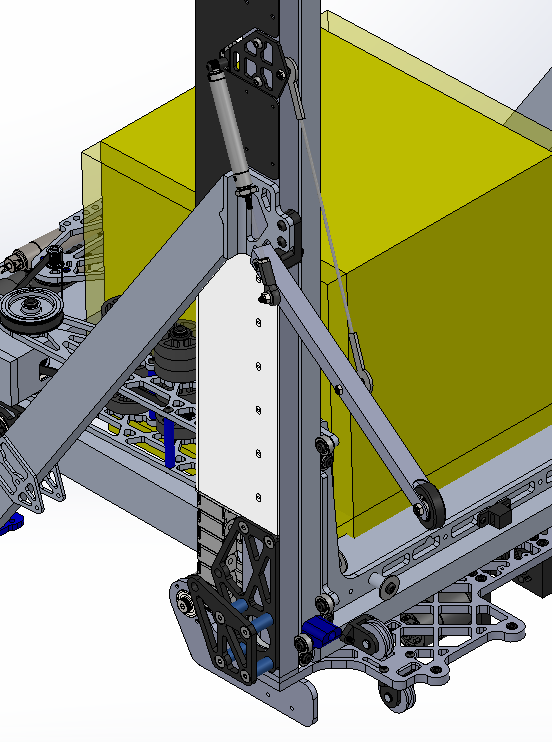 We did see some promise with this intake, however since it was designed for the tote and not the Power Cube dimensions, we were not able to efficiently intake the Power Cube. 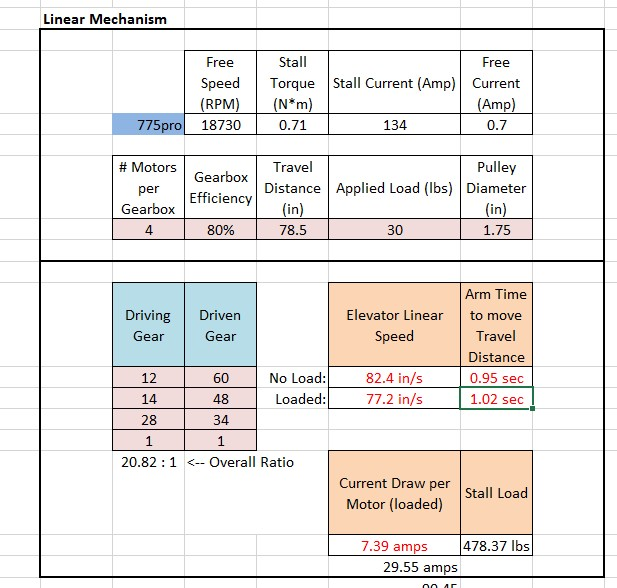 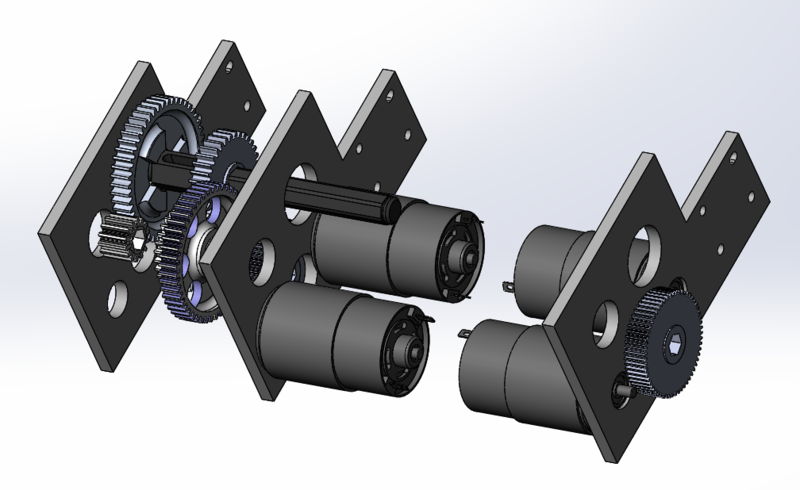 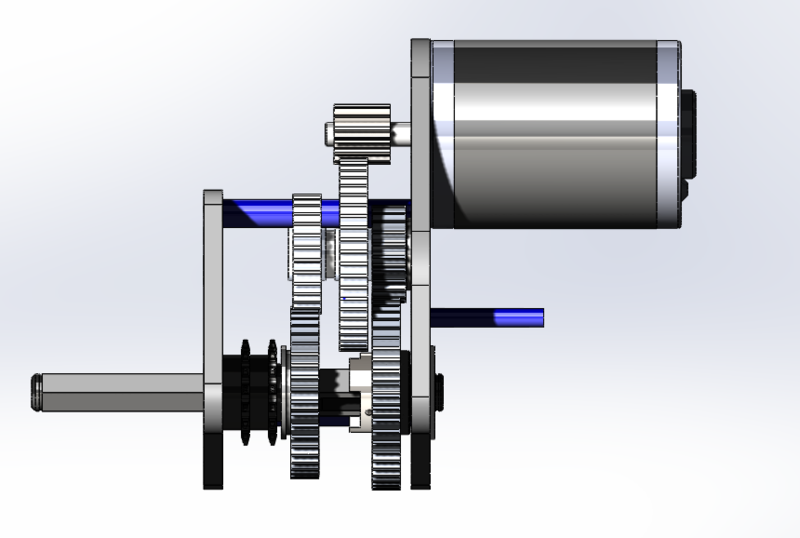 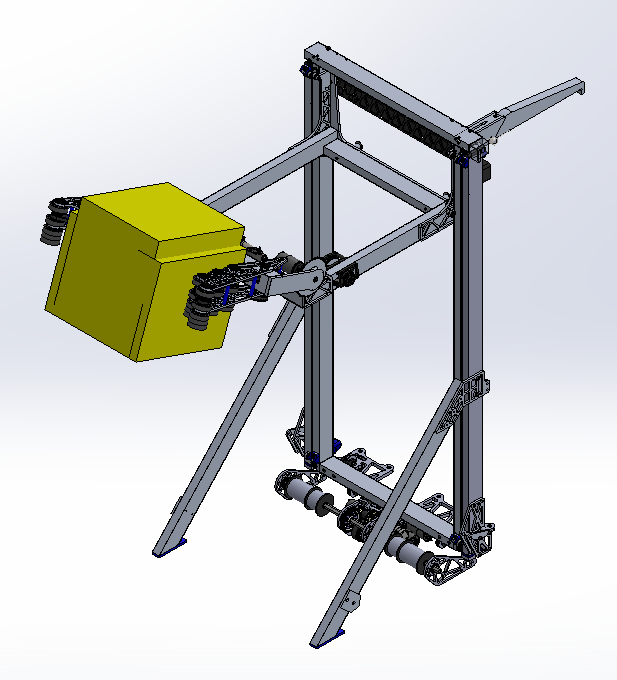 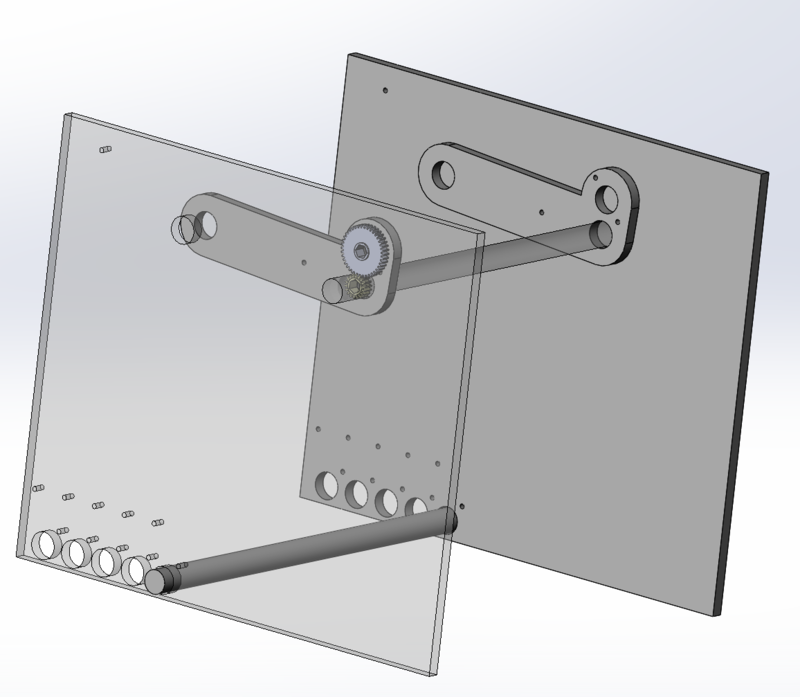 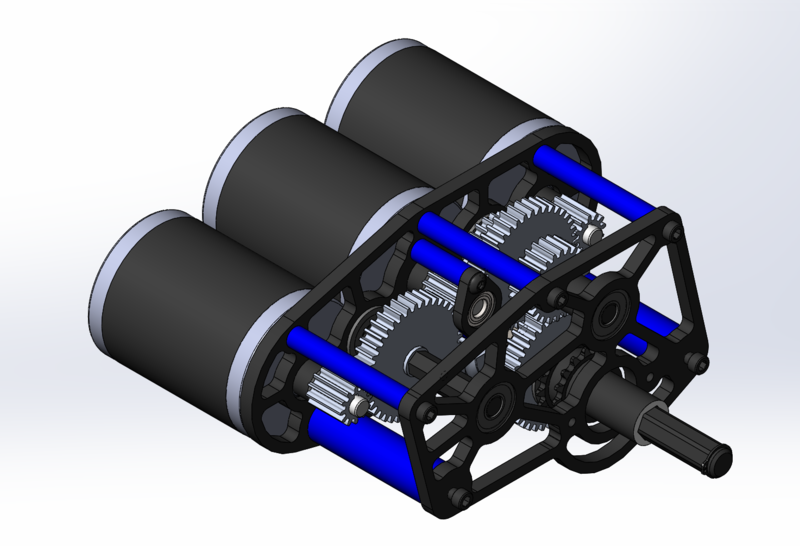  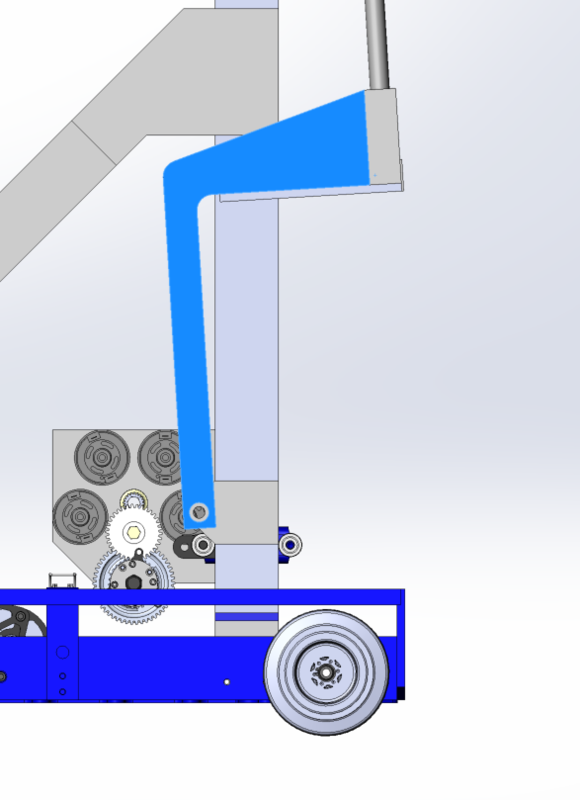 Moving forward, we plan on testing out different wheel materials to contact the Power Cube as it is being intaked and will design/prototype an intake with the correct geometry to fit the width of the Power Cube. 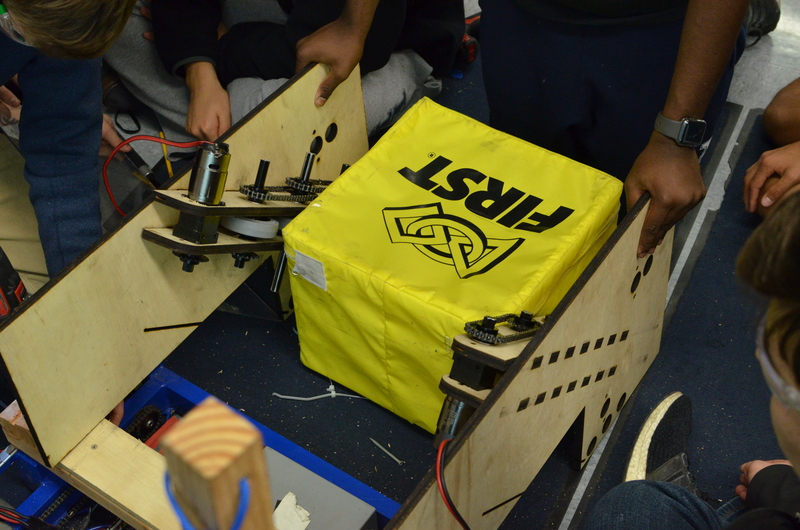 We wanted to calculate the coefficient of kinetic friction between the Textured HDPE and the fabric of the Power Cubes. 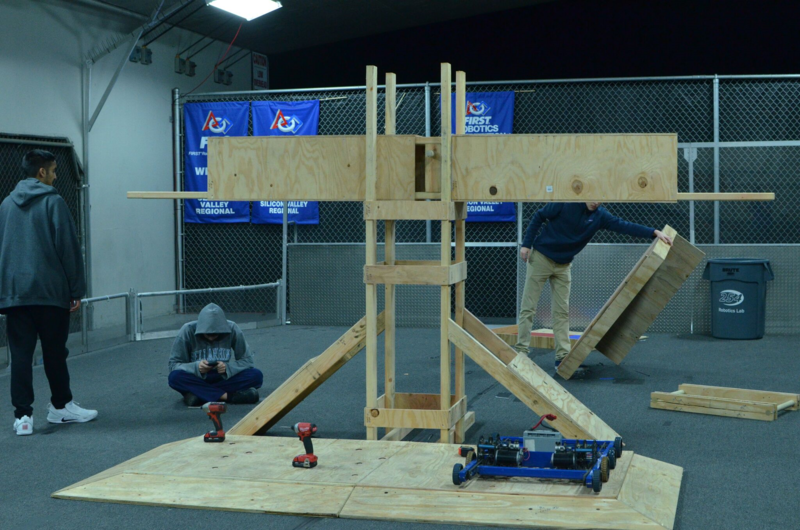 To do this we looked at how high we had to lift the straight piece of HDPE before the Power Cube started to slide down. 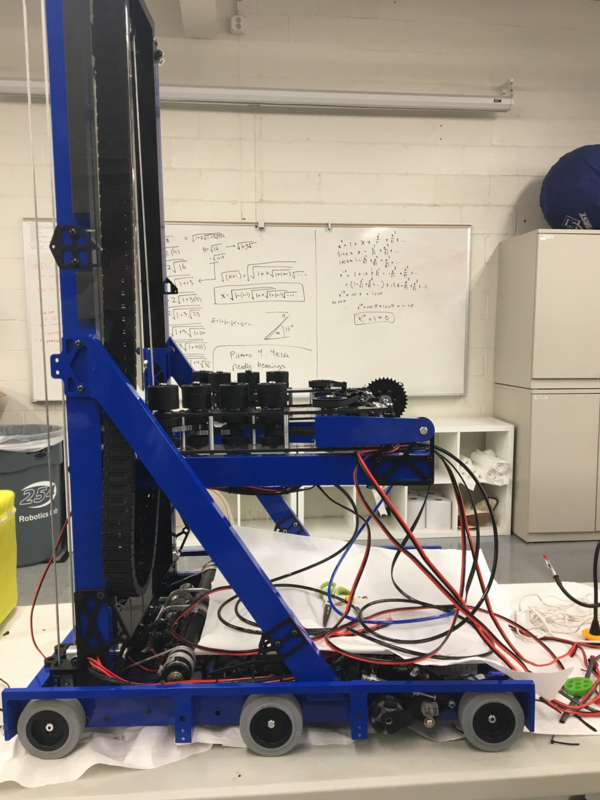 From this we calculated the angle formed and the coefficient of kinetic friction which ended up averaging to about 10.32 degrees and 0.18, respectively. 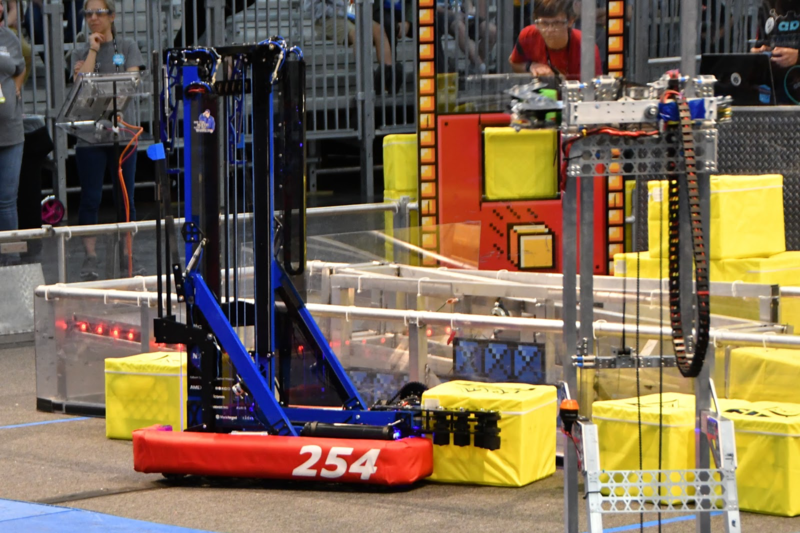 We laid out the spacing of three robots on the scale platform to see if it was physically feasible of having 3 robots side by side with enough space for the robots to maneuver to those locations. 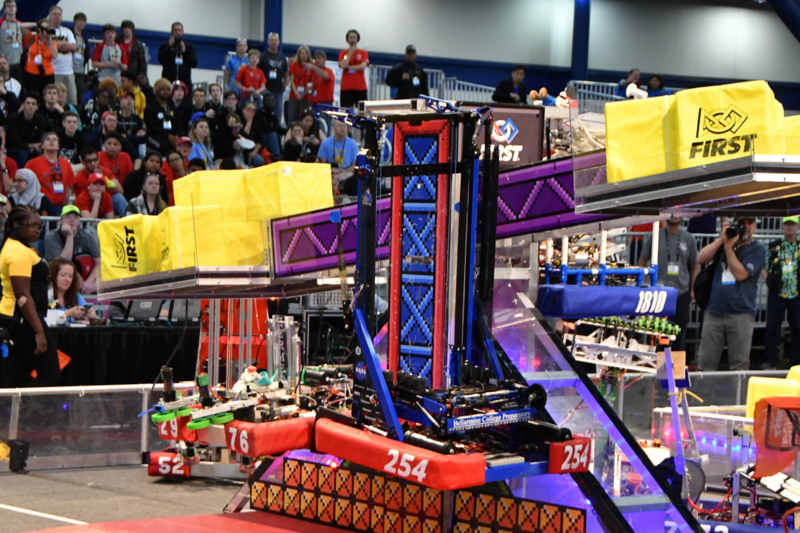 It seems that it is possible for 3 robots to fit on the platform. 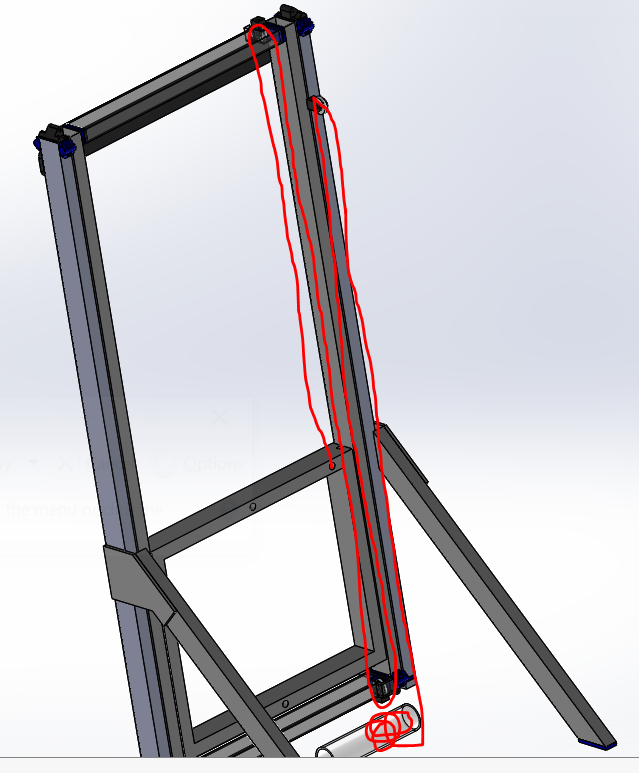 At its highest state, the scale tilts to around an angle of 7.662 degrees. 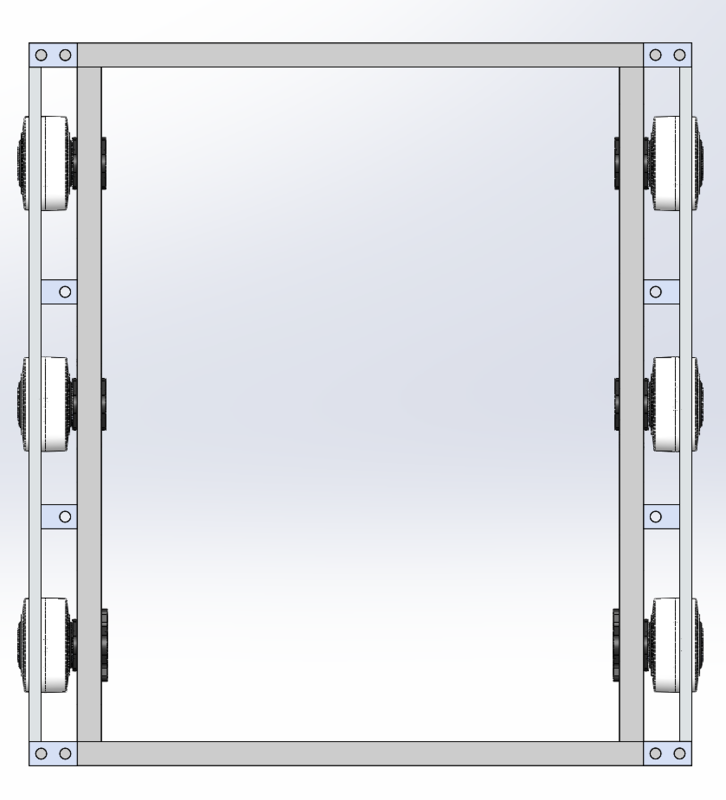 Based on our data gathered from the task: “Test coefficient of friction of Power Cube on scale plate”, the Power Cubes will not slide down the scale plate when it is tilted to its highest state. 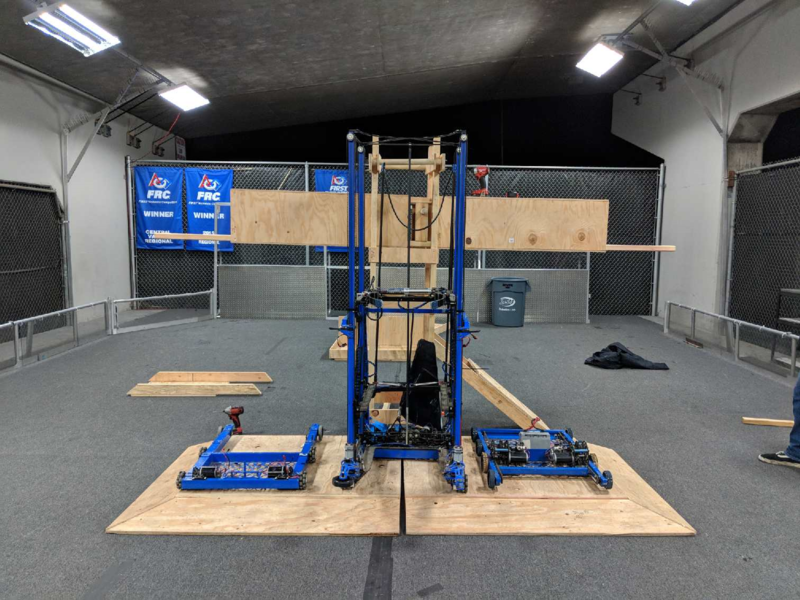 We assembled a wooden version of the scale, however we are planning on assembling an aluminum version similar to the scale we will see in competition. 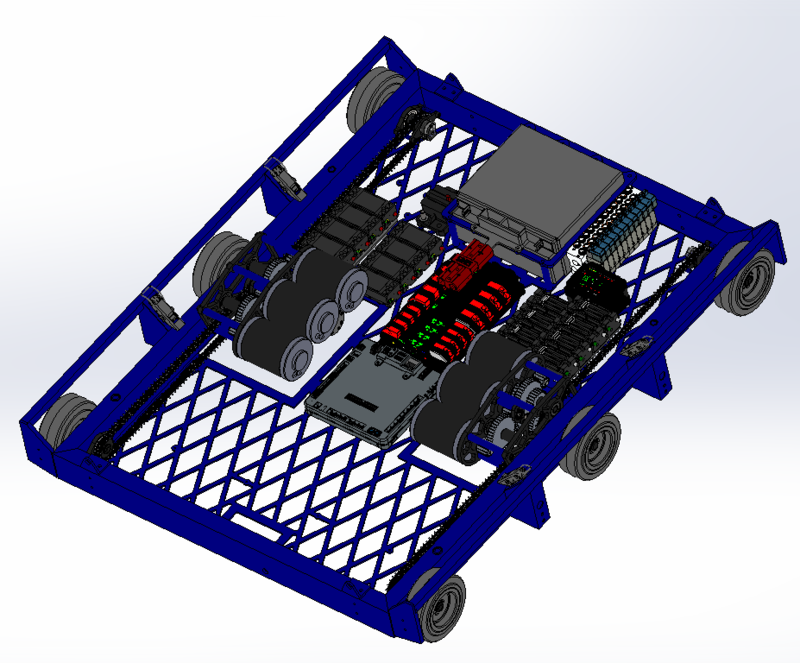 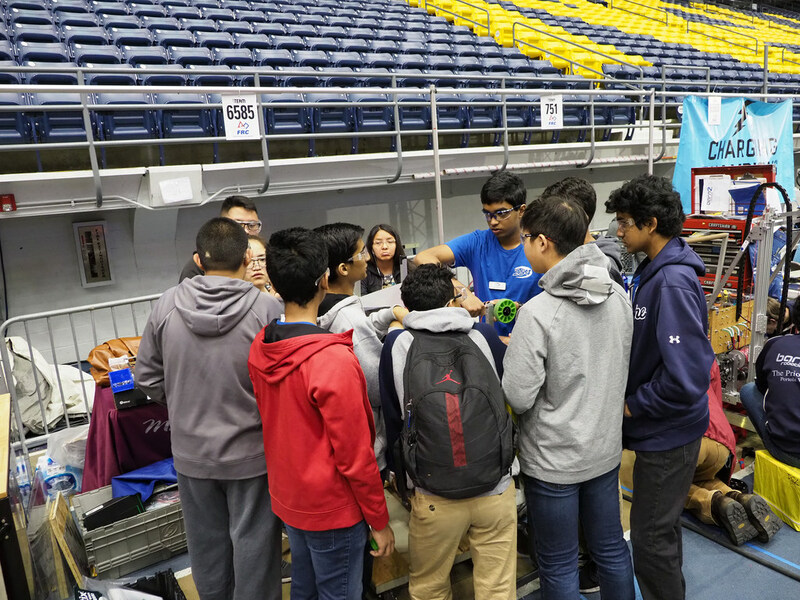 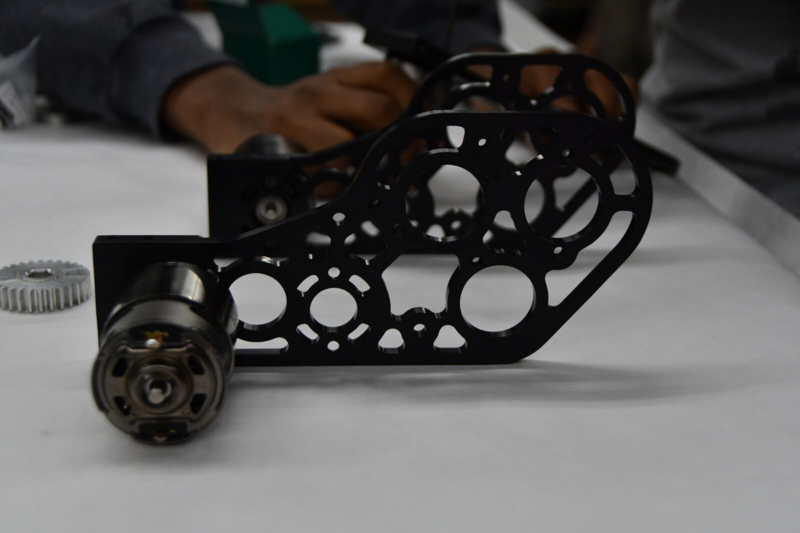 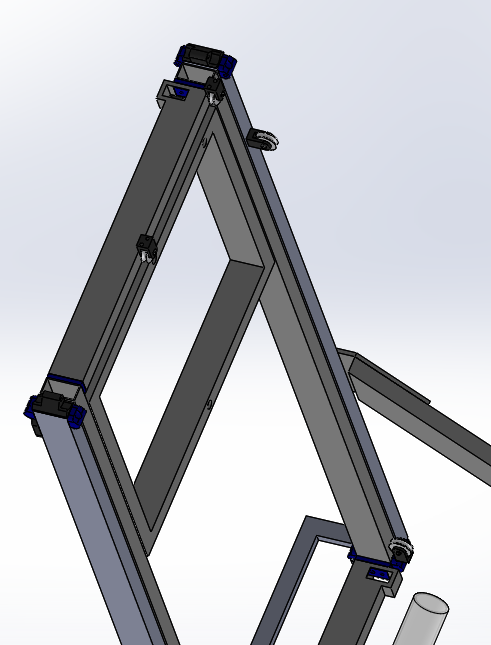 This is because we don’t want any differences from the tournament scale from different materials that will arise in different materials (center of mass, weight, friction) which may impact our robot performance and drive our robot design. 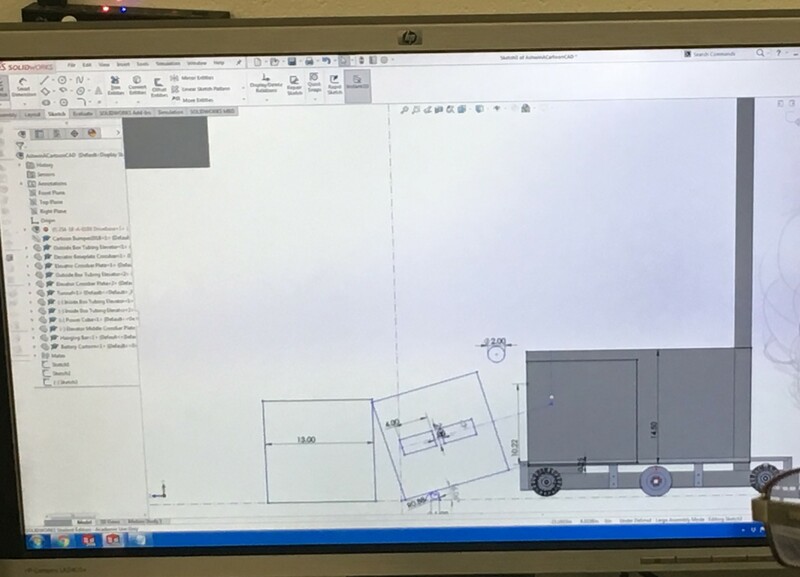 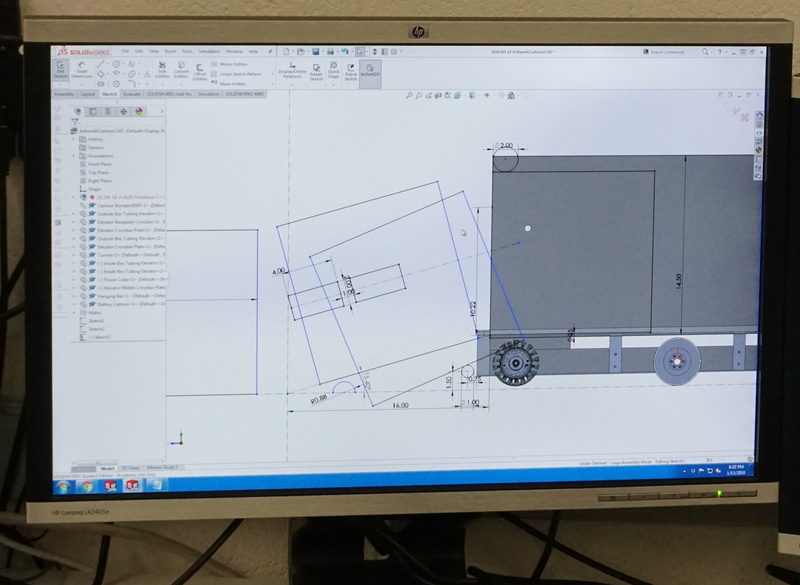 In CAD, we made a space claim of 3 robots, placed them in various arrangements on the scale platform, and looked at the feasibility of having all 3 side by side. 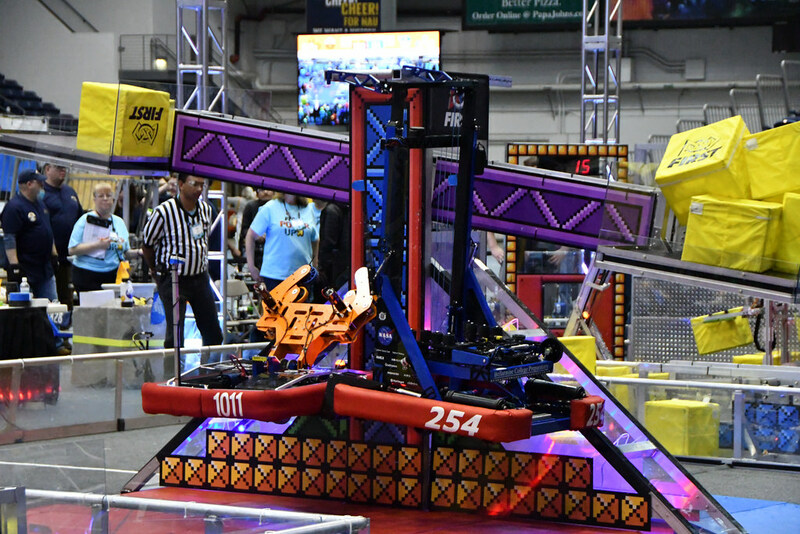 It seems that it is possible for 3 robots to fit on the platform. 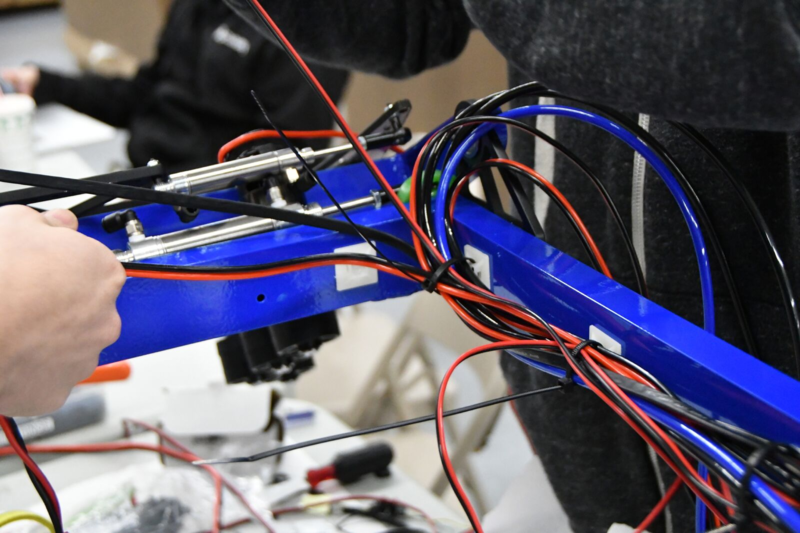 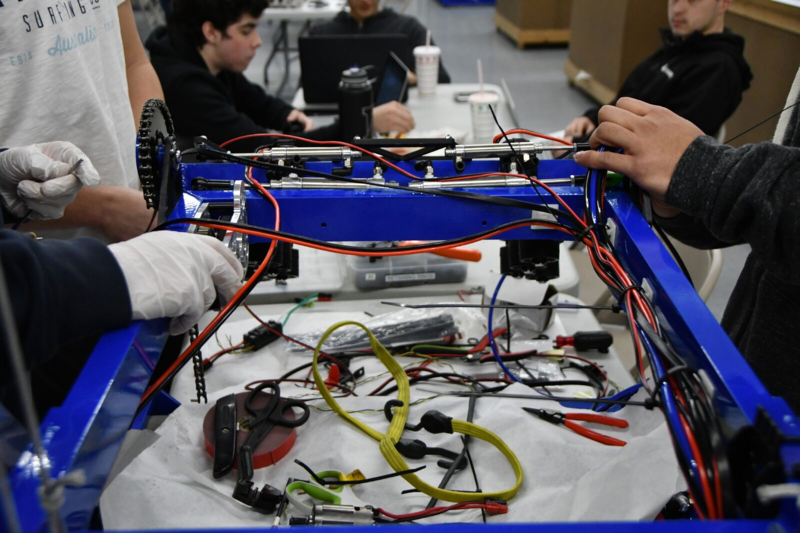 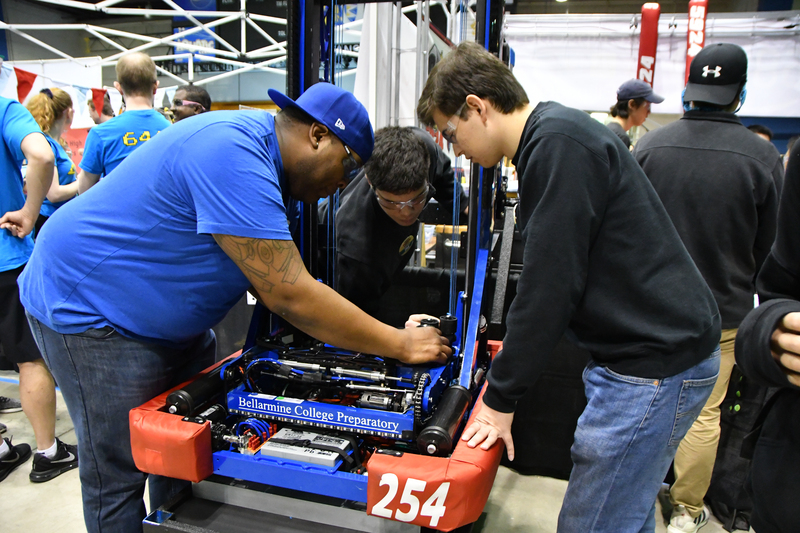 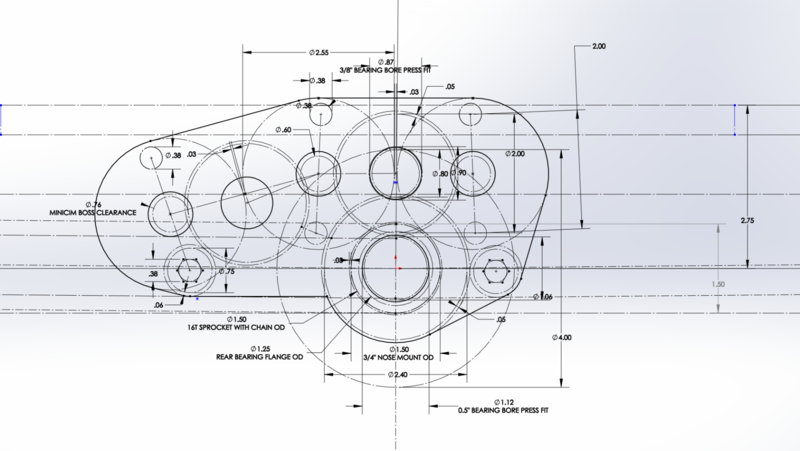 When we initially placed the development board control system on the 2015 robot and attempted to drive it, the wheels were turning in the opposite direction to the controller joysticks. 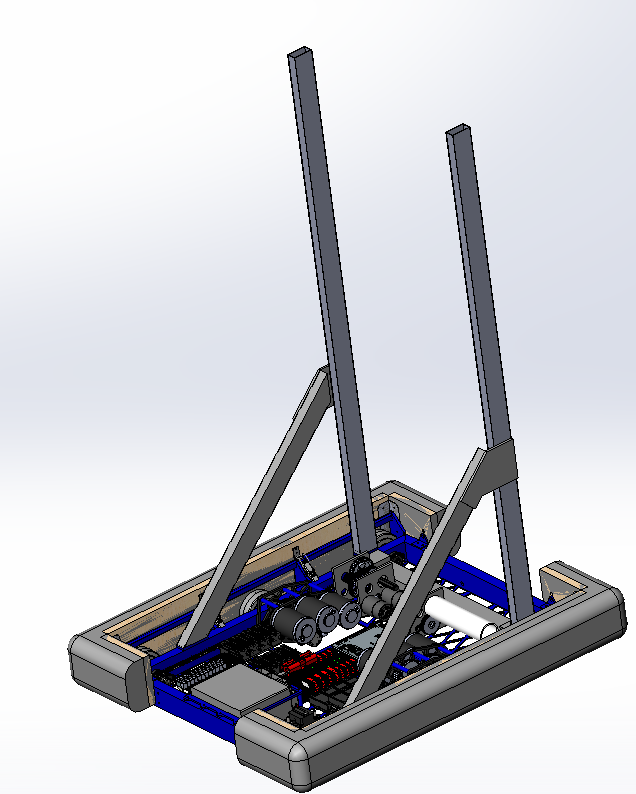 We corrected this by reprogramming the drivebase to match with the direction of the controller joysticks.